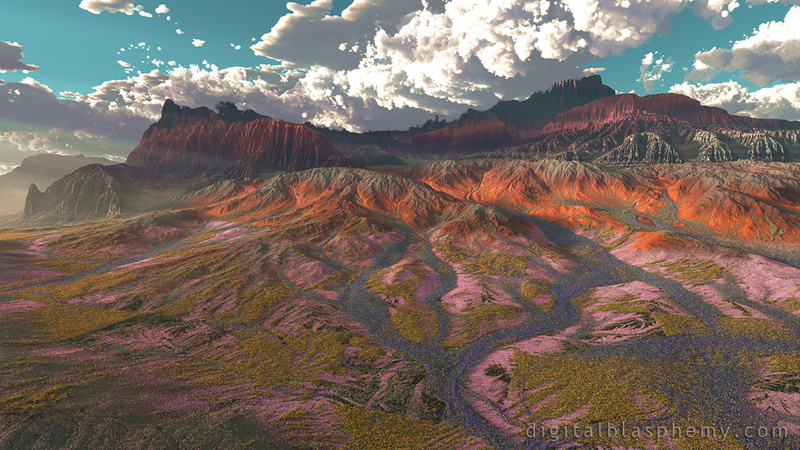 I created this one as an exercise to learn a new landscape modeler called "Gaea". After seeing the incredible images of California's "superbloom" I thought it would be interesting to add wildflowers to the mix. Still trying to decide if I like the results though. I used Gaea's ability to generate different "flow maps" to place the different colored blooms. I see a lot of potential with this software and this is just the start :-) Hope you enjoy it!! This, to me, looks more like the fresh colors of a new day across the various elevations of the desert. Looks like the drive on the back roads up the Mogollon Rim. Have you thought about this as a MacOS Dynamic Wallpaper? This would blow my mind. Awesome! Was just out to Vegas and Red Rocks. This wants me to go back and explore some more. We have a wonderful country. We are very fortunate! ...but short on visible blooms from this distance of viewpoint. Persevere with Gaea, Ryan: it'll give you a masterpiece once you master it! Love this Desert scene, very well done. I've always loved your desert scenes and this is a worthy addition. It may be my Arizona bias, but the color balance seems a bit off though. Good, but could be better. If you want inspiration for something similar, consider insanely lush scenes of palo verdes in bloom this time of year. If you haven't seen them, there's a good example in The Villain, looking down into a valley full of them. They also follow arroyos in the lower deserts -- Arizona Highways has had zillions of to-die-for photographs over the years. I love the background, but the foreground kind of kills it with the blooms that turn out as dots all over. @BobC Said that the eye is not certain where to focus on this one. I agree, and I love that about this particular piece. You could slice this one up a few different ways, and each slice would be an interesting wallpaper. Shifting my gaze from the matte teal sky down through elements that are shiny, textured, noisy, and then back up again tickles my brain. A bit like the Superstition Mountain caldera. Love the colors too. 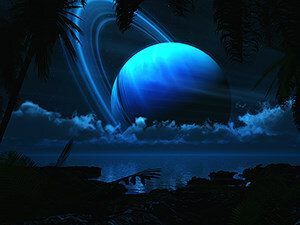 This is a beautiful render it reminds me of the beauty and vastness of deserts. You've captured that feeling well. I suspect you were inspired by Zabriskie Point in making this image. I have seen Death Valley looking like this after a wet winter. I think the reason I'm having mixed reactions to this image is that the upper half seems to have been more successful than the lower half and the eye is not certain whether the focus is the alluvial fans with flowers or the rather dramatic formations and sky in the upper half. The plains and the sky both look normal. The mountains look distorted inward, as if seen through a fish-eye wide-angle lens. Kind of a weird effect. This is just amazing! Looking forward to more images build with this tool. Wow I really love this one! I love your landscapes! Looking forward to see what else you can do with that software! "Really like where this is going!" Really neat work, Ryan (as usual)! I like where it is headed. I hope that we'll get multiscreen renders of this one (as well as many of the backlogged ones like Chisen, Pali v2, Revival, Breath of Spring, and especially both versions of Greenmire).